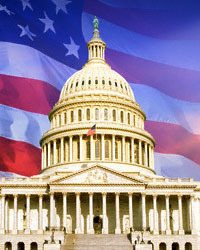 On the first Thursday of every February, a National Prayer Breakfast is held in Washington, D.C., hosted by weekly Bible study/prayer groups held in the U.S.
Senate and House, and attended by the U.S. President, and about 3000 of our other national leaders and leaders from around the world. "Almighty and merciful God, our nation pauses today to seek your strength, to ask for your protection, and to reflect upon the many blessings you have given this great land. "We ask you to help us find the road to peace, to guide us on this path even as we face those who would bring war to our shores. "We know from your prophet Isaiah that he saw a vision of a future day when the nations of the world would beat their swords into plowshares and their spears into pruning hooks. "But until the coming of that great day it is right for us to pray that you would preserve our nation and give us courage to defend it wisely. We pray that you give us patience in the face of adversity. We ask that you grant us compassion for those who seek our help to find justice and freedom. "As we begin this National Prayer Breakfast we ask your blessing be upon our President and his cabinet, our Senators and Representatives in Congress, the Governors of our States, the Mayors of our Cities, indeed all of our leaders. "We pray for the families of our fallen heroes, and we are reminded of your scripture, that greater love has no one than this, than to lay down one's life for his friends. your people. Hear our prayer O God, for we pray in your Holy Name, Amen." President Bush spoke on the importance of prayer and the acts of charity being done by our troops in Iraq toward the local residents there. importance of forgiveness, love and non-violent conflict resolution, as modeled in the American civil rights movement led by Dr. Martin Luther King in the 1950's and 60's. It was noted that the Israeli ambassador was in attendance along with the ambassadors of several Moslem nations. The prayer meeting closed with Coach Joe Gibbs of the Washington Redskins professional football team giving his testimony of receiving Jesus Christ as his personal Lord and Savior. Text and video of President Bush's message is available at www.whitehouse.gov (search for National Prayer Breakfast, February 5, 2004). --love God with all your heart, soul, mind and strength and your neighbor as yourself. For the text and video of President Bush's remarks: www.whitehouse.gov search for National Prayer Breakfast 2/3/05. Before President Bush spoke it was reported from the podium that this annual event was started in 1953 in response to then-President Eisenhower's comment that he was living in the loneliest house in America. This year's speakers included President Bush and Bono, the lead singer from the rock music group U2. Bono emphasized caring for the poor, especially AIDS victims in Africa. For the text and video of President Bush's remarks: www.whitehouse.gov search for National Prayer Breakfast 2/2/2006 (See text below). For a video of the entire event (only available for a few days after Feb. 2, 2006): www.c-span.org look under "Recent Programs" for: "Bono & Pres. Bush at the Annual National Prayer Breakfast." Almighty freely. From these prayerful beginnings, God has greatly blessed the American people, and through our prayers, we give thanks to the true source of our blessings. Americans remain a prayerful people today. I know this firsthand. I can't tell you the number of times out there traveling our country, people walk up, total strangers, and say, Mr. President, I'm praying for you and your family. It is one of the great blessings of the presidency, and one of the most wonderful gifts a person can give any of us who have the responsibility to govern justly. So I thank wonderful gifts. Every day, millions of Americans pray for the safety of our troops, for the protection of innocent life, and for the peace we all hope for. Americans continue to pray for the recovery of the wounded, and to pray for the Almighty's comfort on those who have lost a loved one. We give thanks daily for the brave and decent men and women who wear our nation's uniform, and we thank their families, as well. bow our heads or fall to our knees, we are all equal and precious in the eyes of the Almighty. lives, our talents and all that we own ultimately flow from the Creator. And in these moments of our deepest gratitude, the Almighty reminds us that for those to whom much has been given, much is required. prayer, our faith is strengthened, our hearts are humbled and our lives are transformed. Prayer encourages us to go out into the world and serve. In our country, we recognize our fellow citizens are free to profess any faith they choose, or no faith at all. You are equally American if you're a Hebrew -- a Jew or a Christian or Muslim. You're equally American if you choose not to have faith. the displaced. We saw an outpouring of compassion after the earthquake in Pakistan and the tsunami that devastated entire communities. We live up to God's calling when we provide help for HIV/AIDS victims on the continent of Africa and around the world. together before the Almighty in prayer, to reflect on God's will, to seek His aid, and to respond to His grace. I want to thank you for the fine tradition you continue here today. I pray that our nation will always have the humility to commend our cares to Providence and trust in the goodness of His plans. Good morning. I want to thank the Co-Chairs of this breakfast, Representatives Heath Shuler and Vernon Ehlers. I’d also like to thank Tony Blair for coming today, as well as our Vice President, Joe Biden, members of my Cabinet, members of Congress, clergy, friends, and dignitaries from across the world. Michelle and I are honored to join you in prayer this morning. I know this breakfast has a long history in Washington, and faith has always been a guiding force in our family’s life, so we feel very much at home and look forward to keeping this tradition alive during our time here. It’s a tradition that I’m told actually began many years ago in the city of Seattle. It was the height of the Great Depression, and most people found themselves out of work. Many fell into poverty. Some lost everything. The leaders of the community did all that they could for those who were suffering in their midst. And then they decided to do something more: they prayed. It didn’t matter what party or religious affiliation to which they belonged. They simply gathered one morning as brothers and sisters to share a meal and talk with God. These breakfasts soon sprouted up throughout Seattle, and quickly spread to cities and towns across America, eventually making their way to Washington. A short time after Preside nt Eisenhower asked a group of Senators if he could join their prayer breakfast, it became a national event. And today, as I see presidents and dignitaries here from every corner of the globe, it strikes me that this is one of the rare occasions that still brings much of the world together in a moment of peace and goodwill. I raise this history because far too often, we have seen faith wielded as a tool to divide us from one another – as an excuse for prejudice and intolerance. Wars have been waged. Innocents have been slaughtered. For centuries, entire religions have been persecuted, all in the name of perceived righteousness. There is no doubt that the very nature of faith means that some of our beliefs will never be the same. We read from different texts. We follow different edicts. We subscribe to different accounts of how we came to be here and where we’re going next – and some subscribe to no faith at all. But no matter what we choose to believe, let us remember that there is no religion whose central tenet is hate. There is no God who condones taking the life of an innocent human being. This much we know. We know too that whatever our differences, there is one law that binds all great religions together. Jesus told us to "love thy neighbor as thyself." The Torah commands, "That which is hateful to you, do not do to your fellow." In Islam, there is a hadith that reads "None of you truly believes until he wishes for his brother what he wishes for himself." And the same is true for Buddhists and Hindus; for followers of Confucius and for humanists. It is, of course, the Golden Rule – the call to love one another; to understand one another; to treat with dignity and respect those with whom we share a brief moment on this Earth. It is an ancient rule; a simple rule; but also one of the most challenging. For it asks each of us to take some measure of responsibility for the well-being of people we may not know or worship with or agree with on every issue. Sometimes, it asks us to reconcile with bitter enemies or resolve ancient hatreds. And that requires a living, breathing, active faith. It requires us not only to believe, but to do – to give something of ourselves for the benefit of others and the betterment of our world. In this way, the particular faith that motivates each of us can promote a greater good for all of us. Instead of driving us apart, our varied beliefs can bring us together to feed the hungry and comfort the afflicted; to make peace where there is strife and rebuild what has broken; to lift up those who have fallen on hard times. This is not only our call as people of faith, but our duty as citizens of America, and it will be the purpose of the White House Office of Faith-Based and Neighborhood Partnerships that I’m announcing later today. The goal of this office will not be to favor one religious group over another – or even religious groups over secular groups. It will simply be to work on behalf of those organizations that want to work on behalf of our communities, and to do so without blurring the line that our founders wisely drew between church and state. This work is important, because whether it’s a secular group advising families facing foreclosure or faith-based groups providing job-training to those who need work, few are closer to what’s happening on our streets and in our neighborhoods than these organizations. People trust them. Communities rely on them. And we will help them. We will also reach out to leaders and scholars around the world to foster a more productive and peaceful dialogue on faith. I don’t expect divisions to disappear overnight, nor do I believe that long-held views and conflicts will suddenly vanish. But I do believe that if we can talk to one another openly and honestly, then perhaps old rifts will start to mend and new partnerships will begin to emerge. In a world that grows smaller by the day, perhaps we can begin to crowd out the destructive forces of zealotry and make room for the healing power of understanding. This is my hope. This is my prayer. I believe this good is possible because my faith teaches me that all is possible, but I also believe because of what I have seen and what I have lived. I was not raised in a particularly religious household. I had a father who was born a Muslim but became an atheist, grandparents who were non-practicing Methodists and Baptists, and a mother who was skeptical of organized religion, even as she was the kindest, most spiritual person I’ve ever known. She was the one who taught me as a child to love, and to understand, and to do unto others as I would want done. I didn’t become a Christian until many years later, when I moved to the South Side of Chicago after college. It happened not because of indoctrination or a sudden revelation, but because I spent month after month working with church folks who simply wanted to help neighbors who were down on their luck – no matter what they looked like, or where they came from, or who they prayed to. It was on those streets, in those neighborhoods, that I first heard God’s spirit beckon me. It was there that I felt called to a higher purpose – His purpose. In different ways and different forms, it is that spirit and sense of purpose that drew friends and neighbors to that first prayer breakfast in Seattle all those years ago, during another trying time for our nation. It is what led friends and neighbors from so many faiths and nations here today. We come to break bread and give thanks and seek guidance, but also to rededicate ourselves to the mission of love and service that lies at the heart of all humanity. As St. Augustine once said, "Pray as though everything depended on God. Work as though everything depended on you." So let us pray together on this February morning, but let us also work together in all the days and months ahead. For it is only through common struggle and common effort, as brothers and sisters, that we fulfill our highest purpose as beloved children of God. I ask you to join me in that effort, and I also ask that you pray for me, for my family, and for the continued perfection of our union. Thank you.